The Manual Ability Classification System (MACS) describes how children with cerebral palsy use their hands to handle objects in daily activities. MACS describes five levels. The levels are based on the children's self-initiated ability to handle objects and their need for assistance or adaptation to perform manual activities in everyday life. Find further information about MACS in the panel to the left. Download the brochure in 27 different language. 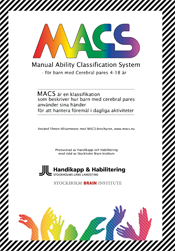 The MACS brochure describes the five levels and differences between adjacent levels, it also gives information about how to use the classification. The Mini-MACS brochure is available in 8 different language. The Mini-MACS brochure, for children 1-4 years of age, describes the five levels and differences between adjacent levels, it also gives information about how to use the classification. Use the flow chart together with the brochure to further clarify the process to determine which MACS level best corresponds with the child's manual ability. This 30 minute film explains the concept and construct of MACS, it show examples of children and the rationale for selecting different MACS levels. Find references for recent articles in the panel to the left. MACS had some issues with downloading leaflets and identification charts that now have been resolved. The problems originated from the hosting company and a bad configuration. A new MACS level identification chart and Mini-MACS in Dutch is now available for download. Follow the link to the left.